Confession: I am kind of a junk a-holic. OK, I am a total junk a-holic and I potentially have a problem (or according to my husband I do have problem!). :) I love old furniture and old stuff. I am always looking for the next yard sale or junk store anywhere I go. So imagine how happy I was when the little town I used to work in was having their annual town yard sale! Small town + old stuff = happy me! 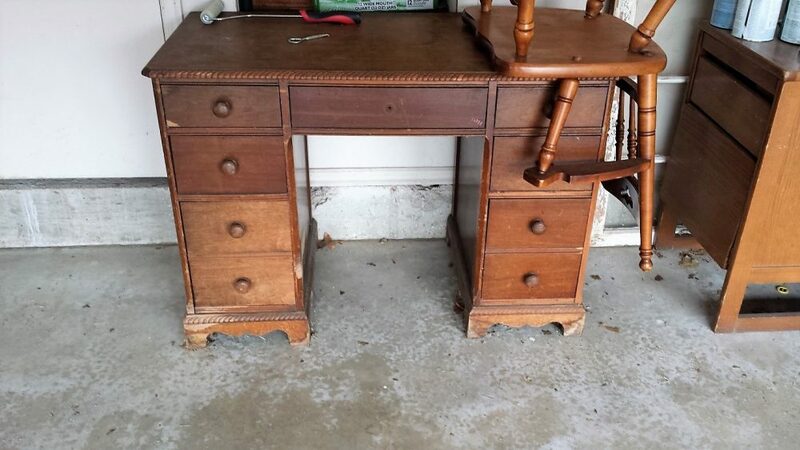 I came across this adorable old desk for $20!!! It was pretty beat up and had some large stains on it so it wasn’t a great option to sand down and re-stain. It was a great option to use with one of my new favorite paints. First thing first was to clean this piece up! I started by taking out all the drawers and removing all the knobs by unscrewing them. 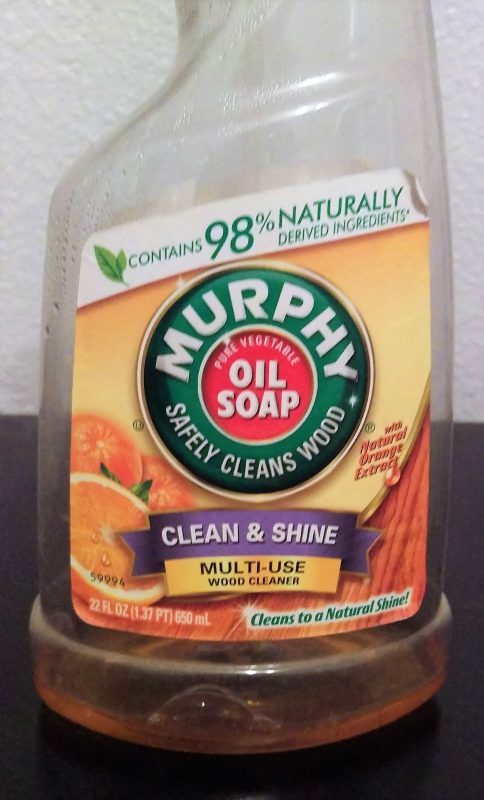 I used Murphy’s Oil Soap (You can buy this at Home Depot/Walmart, etc.) and wiped down all the wood. It will eliminate most smells from the wood and really brings out a great shine. You want to make sure you really clean the pieces off and remove any debris (think spider webs, dead bugs, you know, fun stuff). Now the fun part…painting! Normally you are supposed to sand a wood piece down and then prime and paint it. It’s a lot of work and takes a long time. But, there is this little gem out there called Annie Sloan Chalk Paint. Let me now tell you how amazing this paint is. No need to sand or prime! :) She has many online videos and tutorials to show you exactly how to do it. 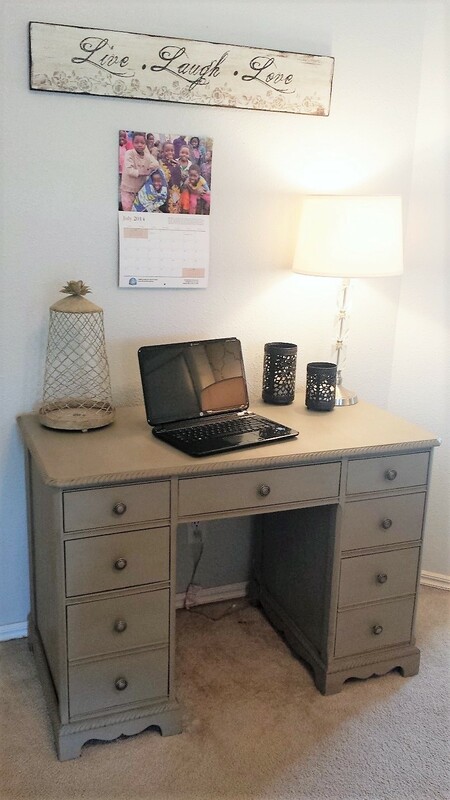 The color I chose for this desk was French Linen. I did two coats on the desk and loved how the paint color turned out. 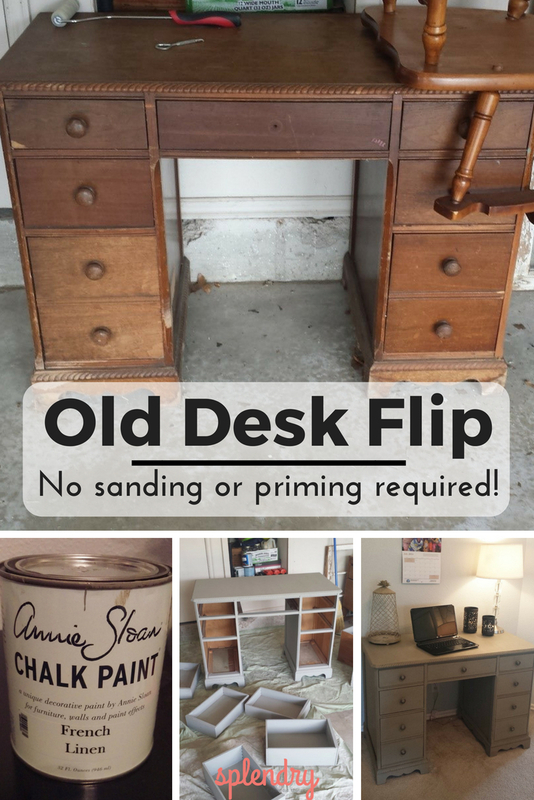 To seal Annie Sloan Chalk Paint (which for a desk you definitely want to do) you apply the clear wax and then to get a distressed look you use the dark wax. I could write an entire post on exactly how to do this but she has great instructions on her website. I chose to go very light with the distressed look because I was loving this grey color! Once everything is dry it’s ready to use. I loved how this desk turned out! From something rough and ugly into something pretty! Want more? Check out this trunk revival, you won’t believe what it looks like now! Can you use antique glaze over this. 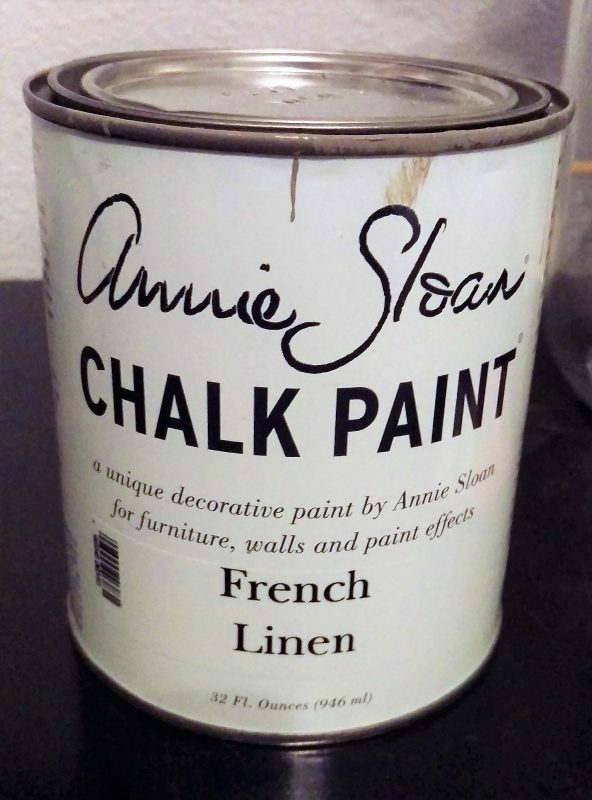 I wasn’t aware of Annie Sloan’s chalk paint. Great find and the desk looks magnificent! Wow. Thanks for the great tips! I got an old desk and several other times too that were given to me. I didn’t know how to fix them. This turned out so great! I love repurposing old items. It looks great! I turned my makeup vanity into my desk. This is beautiful! We have the same desk and painted it. I like how the chalk paint looks too. I recently transformed a armoire and turned it into my craft area. 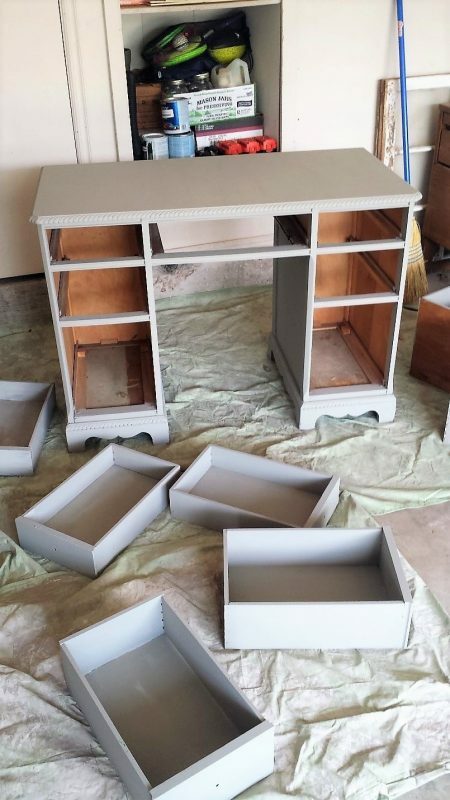 Chalk paint is so easy to use. Thanks for sharing. I love murphy oil soap. Never used chalk paint thinking this needs to change. Love transformation of the desk. I’m glad I am not the only one that knows about Murphy’s Oil Soap! Its fantastic! Hope this isn’t a stupid question, but does the paint have a chalk board feel or rough feel? Not a stupid question! Before you put the wax on the paint kind of has a chalk board feel like a dry flat paint. After the wax it feels really smooth. Let me know if you have more questions! I know right! That’s my favorite part of using it! Awesome! I love how this turned out and your knack for this.